On 23rd and 24th February, a workshop for teachers and students was organized in the school auditorium by AFS, an organization to which recently the school has been affiliated. AFS began during the First World War as the American Field Service, bringing medical assistance to wounded soldiers on the battlefield. It has since evolved into a global organization, working towards world peace and harmony through overcoming cultural barriers that separate people. They also facilitate exchange programmes and, ever since our membership, some students have availed of their short term programmes to various countries. The workshops were obligatory and were a part of the annual membership procedure of the organization. On Saturday, the teachers' workshop, entitled ICL (Intercultural learning) focused on acquiring international mindedness and the challenges that one faces living in today's globalized society. The students' workshop on Global Competencies was designed to instruct students on various sustainable goals and appreciate and, indeed, contribute to the amazing work that some have been doing in making this world a better place. The workshops were well conducted by the AFS representative Ms. Sarita Bhadwar, who organized videos and group activities to ensure the participation of all. Dance is expressive art. India has many dance forms, which display its rich culture. 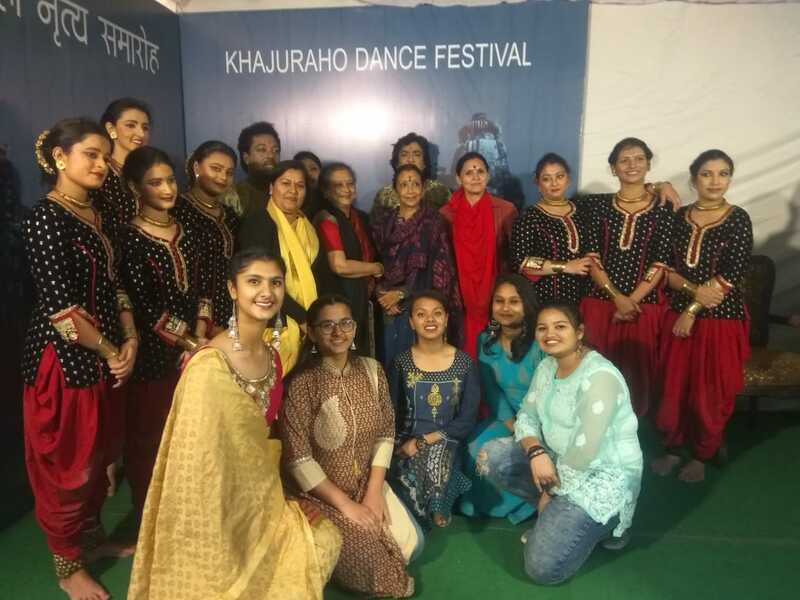 Ten girls of SKV, with two teacher escorts, went to witness the KHAJURAHO DANCE FEST' 2019, at Khajuraho, from 23-02-2019 to 26-02-2019. All members of team could thoroughly learn a lot through different performances of different great eminent Gurus and the team. They are, Sushree Durga Arya performed Kathak with the variety of tatkars and chakars. She is considered as a Nessiah of Indian culture in Europe. Sushree Mom Ganguly and her students performed beautiful Mohiniattam dance with the pure technique describing our life is related to that of a ball. They called it 'kanduk'. Their dance was graceful and elegant. They had the unique hairdos and wonderful costumes. Next came Shri Manav Mahant with his troupe of Kathak dancers. The group was well coordinated. Their impressions were amazing. Manav Ji hails from Gwalior, which is something to be proud of. On 25th, Shri Rahul Acharya, the famous Odissi solo performer displayed a variety of emotions. He depicted 'Ardhnareshwara' and 'Suryashtakam'. His flexibility awed us. He said us to practice at least 5 minutes daily. He added that it is not the quantity but the quality of dance that adds up to the result. The next performance was a dance choreographed by the popular Kathak dancer, Sushri Vaswati Misra. Through their dance, the group narrated how 'Karma' played an important role in the story of Mahabharata. They also showcased the plight of Draupadi. We were mesmerized by their 'smooth chakkars'. Their creativity with the dance was applauded. The last performance of the day by Shri Prabal Gupta and Shri Arnab Bandhopadhyay. Shri Prabal Gupta is a Kathakali dancer and acted as Chitrangada, the warrior princess who fell in love with Arjuna. Shri Arnab is an Odissi dancer who acted as Arjuna. The narration was wonderful and the expressions were mesmerizing. On 26th, Snighdha Venkatramani, a Bharatnatyam exponent performed praising Lord Surya with Suryashtakam. In her next performance she showed Radha's jealousy in Ashtapadi and ended with Tillana praising lord Hanuman. The next performance was of Sushri Bimbawati Devi along with her group who performed a story of 'nayika' who wanted to see Lord Krishna. This group utilized the stage efficiently and left us awestruck. The last performance was by the duo, Sushri MangalaBhatt, a popular Kathak dancer and Sushri Kavita Dwibedi. They performed Suryashtakam and left us clapping with their wonderful Kathak-Odissi fusion. We were fortunate to meet all of them and discuss the nuances of Indian Classical Dances. AKHIL BHARTIYA BHAVBHOOTI SAMAROH was a four day programme held at Jiwaji University, Gwalior, from 20th February 2019 to 23rd February 2019. From SKV, two students participated in the school level competitions. These competition were: essay writing, singing of traditional shlokas. In the latter, Muskaan Kaushik secured the first position, while in essay writing Aayushika Kalta also secured the top prize. The prize, along with a certificate, was a cash award of Rs.500/- each. Indu Chaturvedi, the Sanskrit teacher and HOD of the Indian Languages department at SKV was honoured with the 'Bhavbhooti Samman' for her contribution to Sanskrit, her command over the language and her literary skills. She was one of 40 people from all over the nation to receive this prestigious award. The name Bhavbhooti is taken from the name of a renowned Sanskrit bard who lived in the 8th century in Madhya Pradesh. Basant Panchami is the commencement of spring- even though here in Northern India the remnants of winter still linger. Basant Panchami has a specific meaning: Basant means "spring" and Panchami means "the fifth day". The school celebrated Basant Panchami on 10th February 2019. The day started with saraswati puja in the Saraswati Lawn by all the staff members and students of grade 12. This was followed by a cultural program in MJS Hall. The Indian music orchestra, comprising students from Class 12, performed a raga based on Raag Bhairav. Class 6 recited shlokas and poems. A group song- ritu basant hai aaya sabke man umang hai laya was sung by the students. There was also a lively Kathak dance performance by Rhytham Garg depicting the classical tradition of Shiv Vandhana and Mohini Bhasmasur, where Vishnu killed Bhasmasur with his wit. On this day a nukkad natak competition on women's issues was also organized in the arena. This was dedicated to the Founder Shrimant Vijaya Raje Scindia, who was a champion of women's causes. The topics in these improvised dramatic productions were – Karmaa, Manmarziyan, Paanch din ki red light, hum gum ho gaye. The competition was judged on the following criteria - message and content, dialogue delivery, acting, and expression. 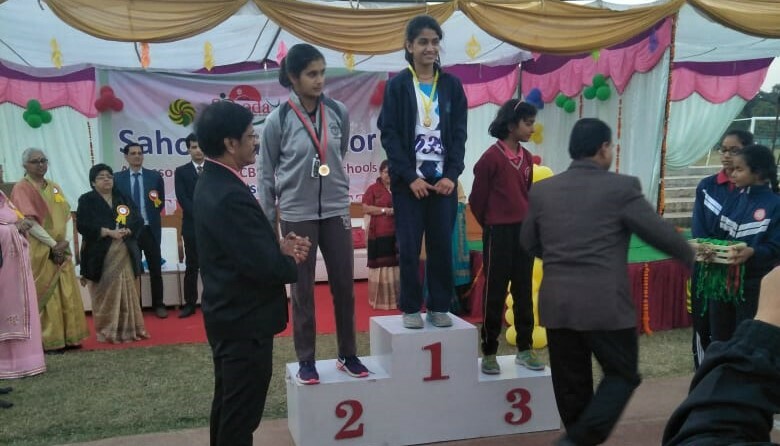 Vasundhara and Yashodhara houses secured the first position, Madhavi bagged the second position and Usha house stood third. The celebrations concluded with a community lunch, which is a tradition of our school, and ex-staff are invited to join the camaraderie. Dr. Alka Chari and Ms. Madhulika Chauhan graced the occasion with their presence. To celebrate this vibrant occasion the children were dressed in colourful Indian attire. 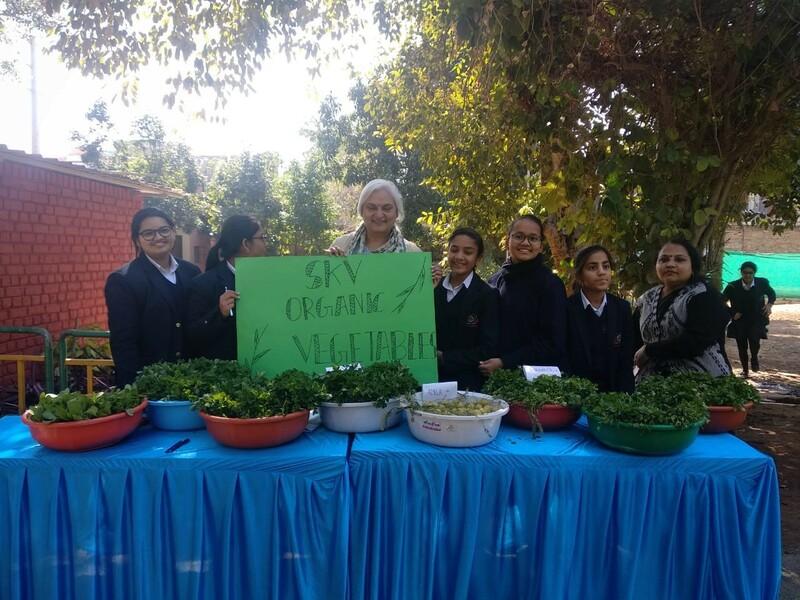 Last December, the Principal, staff and teachers established an organic kitchen garden at SKV, as part of an environmental project. The process started with choosing the appropriate site, preparing the land, sowing seeds like spinach, coriander and fenugreek. Horticulturist Mr. Mahesh Mishra guided us further in planting seeds for brinjal, mint and tomato saplings as well. Three months of hard work resulted in a good harvest. On 8th February Mr. Mishra taught the students the skills involved in vegetable harvesting and the very next day, with much enthusiasm and excitement, spinach, fenugreek and coriander were harvested by the students under the supervision of the principal and teachers – ably guided by the school gardener. Bundles of the produce were sold from a makeshift stall along the main school avenue. Vegetables were packed in bags made from newspaper and sold to staff members as part of the school's drive towards sustainable development. As a marketing strategy amla (Indian gooseberries) were given free of cost with the vegetables and we were able to raise a good amount. This initiative was much appreciated by all, as the students acquired the knowledge of horticulture, as well as brushing up on marketing skills and account keeping. There are further plans to expand the kitchen garden area for sowing summer crops like lady fingers, bottle gourd, green chillies, pumpkin etc. 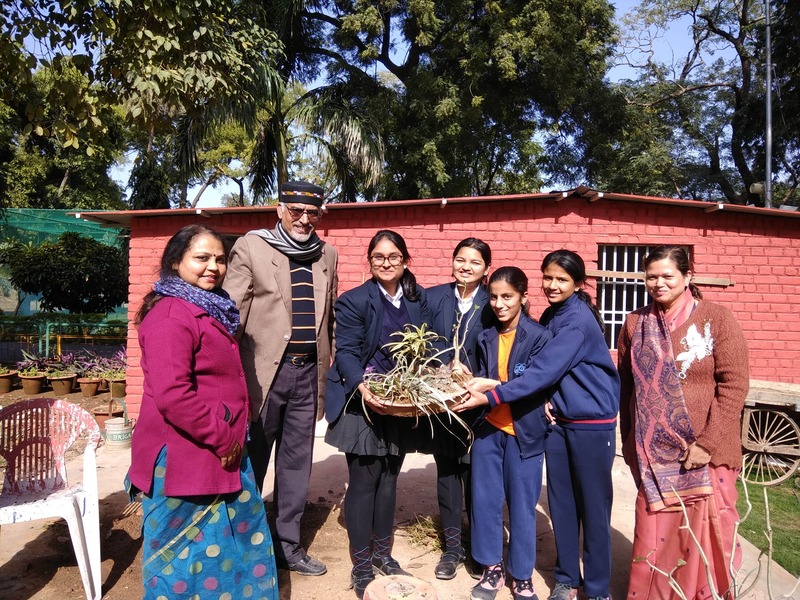 On 8th February, 2019 a tray gardening workshop was conducted by Mr. Mahesh Mishra, a horticulturist. The workshop was organized in the SKV campus with the students of Classes 9 and 11 taking part. Tray gardening is an amazing way to transform a large tray or shallow container with petite plants or dwarf varieties into an enchanted landscape. From the teeny-tiny glass house to itty-bitty tools and thimble-size pots, the design works as a study in detail. Table top gardens can also typically combine with other pipsqueak features -- a miniature gazebo, pebbled path, and decorative doodads -- to make an enchanting scene that rewards curiosity. It is natural scenic beauty which is a pleasure to the eyes. It can be set on a sturdy plant stand or in the middle of a dining table, window sill, shelf, terraces and balconies for a captivating scene. After this training the students with their green fingers have decorated different trays and will be decorating more trays, small and large, in the same way. This training provides the students with the opportunity to learn how to apply artistic skills to the traditional, old ways of gardening. It is an amazing way of decorating one's very own terraces and balconies.